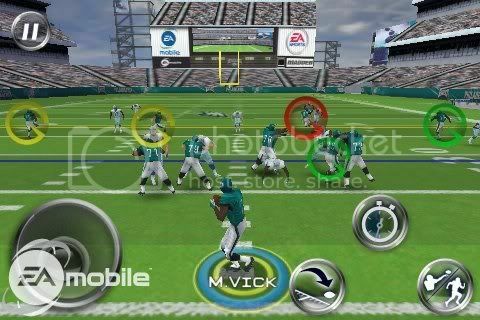 Madden NFL 10 for iPhone From EA Mobile. 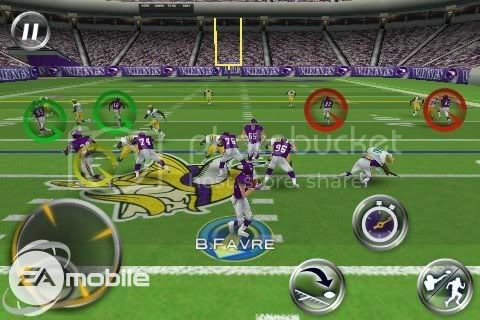 EAMobile has revealed details and posted screenshots of their upcoming Madden NFL 10 game for iPhone. ACCEPT NO IMITATIONS - only EA SPORTS delivers the most authentic, hard-hitting experience in football, and we've got the history to back it up. Combining the realistic action that Madden NFL fans expect with the mobile gameplay that allows anyone to pick-up and play - Madden NFL 10 brings the ultimate football experience to the App Store. TAKE IT TO THE GRIDIRON - Dominate the field with packed rosters of your favorite NFL players from all 32 licensed teams. THE REAL DEAL - From Lambeau to Heinz, you'll be impressed by the detail throughout this game. Play in authentic stadiums against life-like players on real NFL teams. CREATE YOUR OWN PLAY - Use touch controls to draw hot routes for passing plays, exclusive to Madden NFL 10. ACTION CONTROL TIME - This cool feature lets you adjust the speed of your game whenever you want, giving you time to pick the best moves for each play. SEASON MODE - Play a quick one-off game, or try the robust season mode, which features in-depth trades, stats and individual player rewards. ASSEMBLE YOUR OWN TEAMS - Detailed roster management gives you full control over depth charts, cross-team trading, and access to huge free agent pools. BROADCAST COMMENTARY - Hear the unmistakable voice of John Madden himself along with legendary announcers Tom Hammond and Cris Collinsworth.